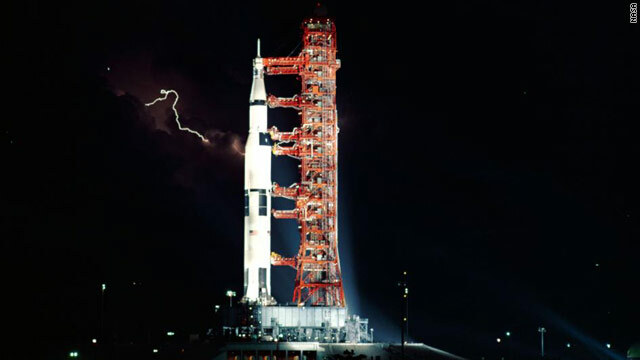 Apollo 15's Saturn V on the launch pad. A decommissioned Saturn V is on display at Johnson Space Center. Editor's note: Montse Cordero is a 17-year-old student from Costa Rica participating in the Foundation for International Space Education's United Space School, a two-week summer program in Houston. She'll be blogging about her experiences in the program here. If you missed it, check out her first post: Getting ready to explore space school. All the students arrived today. I was dropped off at a house where I met a few other students from all over the world. There were people from New Zealand, Wales, Canada, the U.S., and Costa Rica. They all seemed really cool! Eventually, my host family picked my roommate Alex (who is American) and I up. We drove around Houston for a little bit and took pictures with T-38s and other cool things. We had some great food for dinner and discussed what the school was going to be like. We still don’t know much besides the fact that tomorrow we’ll have a lunch with everyone from the school, then interviews to see which team we will be on. I’m sure I’m not the only one super excited to see what’s coming! Tomorrow will be a big day, that’s the one thing I know for sure. Today was our first actual day of Space School. The activities didn’t begin until noon, so we took advantage of the morning with our host to go to Johnson Space Center and see some pretty neat things! Today’s highlight was probably visiting Project Morpheus’ lander. We got to see it in the hangar where they’ve been working on it, and then we saw it again outside when they were having a little celebration because it’s getting shipped to Kennedy Space Center soon for further testing. After Project Morpheus we went to the rocket park where we got to see the amazing Saturn V. I have had the luck to see other Saturn Vs before, but they will always take my breath away. As soon as we walked in we could see how incredibly big this rocket is. It doesn’t even seem real! At lunch, we met all of the other students and mentors. We also had speeches from the head teacher, the head master, and other people who make it possible for us to be here. Then, we went to the University of Houston, Clear Lake campus, where we got into groups and were interviewed to see which team would be best for us, taking into account our interests and our abilities. There are five teams. Yellow is in charge of logistics for our Mars mission. Maroon works the Earth to Low Earth Orbit part. Red handles Low Earth Orbit to Mars. Green is all about living on Mars. Blue has to do with working and exploring there. Personally, I would be very happy to go into pretty much any team. I’ve been a space geek for a very long time; this means I can get very excited about all aspects of space exploration, which would allow me to fit in well for a lot of different tasks. Tomorrow we should learn which team we were chosen for. I’m really looking forward to learning who I’ll be working with for the next few weeks and what we’ll be doing. Now all that's left today is to rest well and prepare for a long and exciting day.